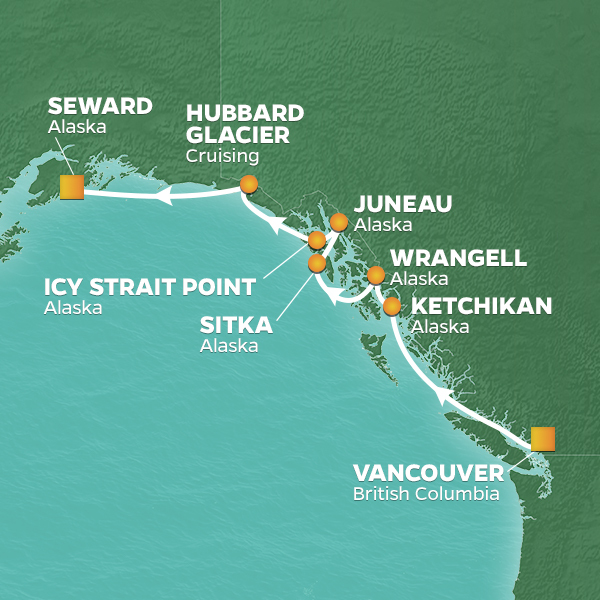 This voyage packs a lot of adventure into just eight days. From Vancouver, sail the Inside Passage, a showcase of glacier-capped mountains, winding fjords, small islands and native wildlife. In Ketchikan, take a walking tour of the historic old town, learn about totem poles, or visit nearby Tongass National Forest and beautiful Misty Fjords-and thanks to a late stay, you won't have to choose! Next stop is Wrangell, one of Alaska's oldest towns. Play archaeologist and examine primitive rock carvings dating back over 1,000 years, or set out on a day trip to Anan Wildlife Observatory. In beautiful Sitka you'll find an onion-domed Cathedral and authentic 18th-century architecture. The big ships don't dock here, so you can enjoy an uncrowded experience. You'll have a late stay in Juneau, Alaska's capital, with opportunities for dog sledding, or a canoe ride to Mendenhall Glacier. Enjoy more scenic sailing to Icy Strait Point and beyond to blue-lit Hubbard Glacier, where you'll be close enough to hear crashing booms of calving ice. Your boutique hotel at sea, the Azamara Quest® is a mid-sized ship with a deck plan that's intimate but never crowded, and offers everything modern voyagers are looking for—plus some unexpected extras.